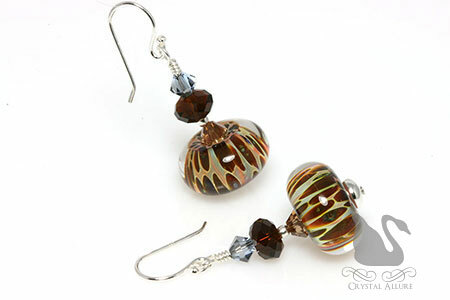 It's easy to update your seasonal wardrobe with one of these affordable lampwork earrings. Or grab all of them and have four seasons of handmade beaded earrings for a full year of accessorizing! Pink is the nationally recognized ribbon color for Breast Cancer Awareness and support. 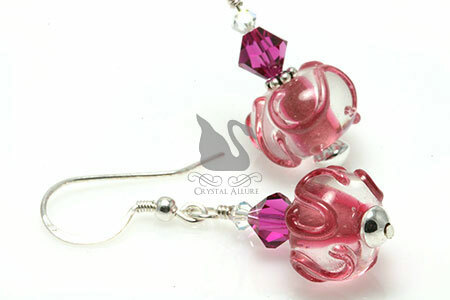 These amazing spring beaded earrings feature beautiful pink lampwork beads with a raised swirl textured design. Sterling silver beads and Bali spacers along with both aurora borealis (AB) and fuchsia Swarovski Austrian Crystals rest on top to complete this design. Sterling silver hooks. Length is 1" from the bottom of the ear wire. A beautiful bright light green swirled lampwork glass bead is accented by peridot green, crystal aurora borealis Swarovski Austrian Crystals, .925 Bali and sterling silver beads. Length is 1" from the bottom of the sterling silver ear wire. Teal has been a very popular summer color for the last two years. Teal is also the nationally recognized ribbon color for Ovarian Cancer Awareness and support. These refreshing summer beaded earrings are as beautiful as swirling ocean waves! 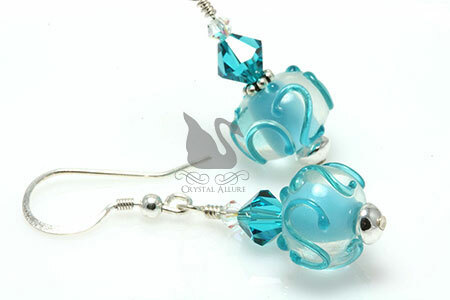 They feature elegant teal lampwork glass beads with a raised swirl textured design. Sterling silver beads and Bali spacers along with both aurora borealis (AB) and blue zircon Swarovski Crystals rest on top to complete this design. Sterling silver hooks. Length is 1" from the bottom of the ear wire. Ohhh,the rich colors of autumn!! You can almost smell the pumpkin pie cooking! Cozy handmade fall beaded earrings inspired by autumn Pumpkin Spice lattes. 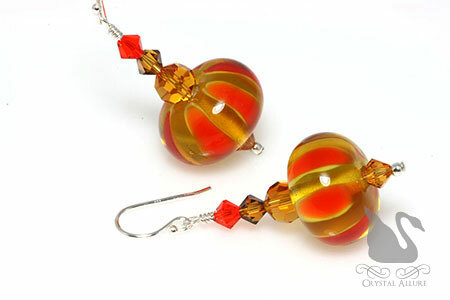 Design features delicious topaz burnt amber orange lampwork glass beads "baked" with topaz, smoke topaz and a spicy-orange hyacinth Swarovski Crystals on sterling silver french hook earwires. Length is 1-1/2" from the bottom of the ear wire. This stunning pair of handmade earrings featuring an artisan boro glass chameleon color lampwork bead, accented with deep rich mocca Swarovski Crystals, light smoked topaz, light sapphire satin Crystals, sterling silver beads and sterling silver french hook ear wires. Length is 1" from the bottom of the ear wire. These stunning artisan boro glass lampwork beads were created by the talented Russ Powers. These giftable winter beaded earrings are the perfect accessory or gift for holiday time! 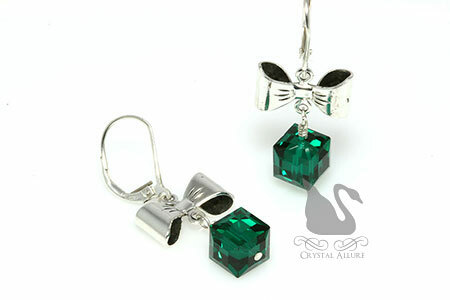 We have "unwrapped" our latest design to present you with a pair of emerald cube Swarovski Crystals dangling from silver bow charm links, like ornaments on a tree. Sterling silver leverback ear wires. Length is 3/4" from the bottom of the ear wire; 1-1/4" in total from top of ear wire. 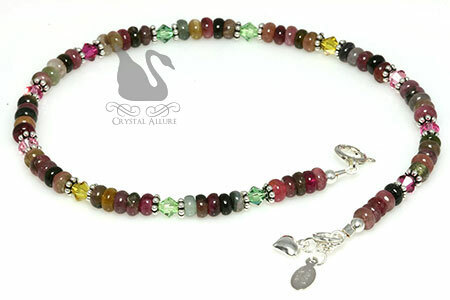 Tourmaline happens to be one of my favorite gemstones because it embodies all possible color combinations imaginable. I recently learned, ancient legend says that tourmaline can be found in all colors because it traveled along a rainbow and collected all the rainbow's colors. How cool is that?! There are also two good reasons to own a piece of tourmaline: (1) it's a bright and beautiful gemstone and; (2) it's a high quality gemstone that is affordable. Watermelon tourmaline is a rainbow of color featuring fuchsia, pink, lilac, emerald green, olive and ochre jewel tones that when combined create sophisticated handmade gemstone beaded jewelry that radiates pure elegance. This handcrafted beaded anklet features mouth-watering watermelon tourmaline in a lovely rainbow spectrum of shades varying from green to pink, accented with a variety of sparkling colorful summer Swarovski Crystals, sterling silver beads and .925 Bali. Finished with a delicate sterling silver heart charm and our signature jewelry tag. Anklet measures 10". This beautiful gemstone necklace is the perfect complement to a hot summers' day! 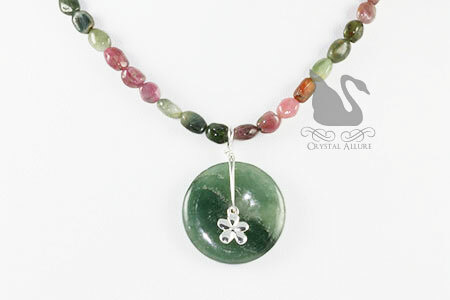 A generous 29mm moss agate gemstone circle pendant is accented with a dainty sterling silver daisy flower charm and wire-wrapped to a full strand of delicious watermelon tourmaline gemstones nuggets. 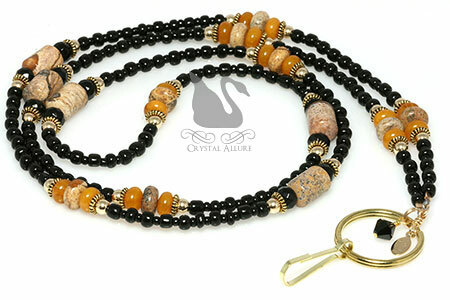 This handmade beaded necklace at a PRINCESS length and is adjustable 17" to 18-1/2". You might remember these beautiful watermelon tourmaline nuggets because they were featured in our Watermelon Tourmaline Gemstone Nugget Drop Earrings (E067) and a similar style necklace. Teal is nationally recognized as the Ovarian Cancer Awareness ribbon color. September is designated as Ovarian Cancer Awareness Month. This is a one of a kind beaded awareness necklace. Handmade beaded necklace raises awareness of the HOPE for an Ovarian Cancer cure. 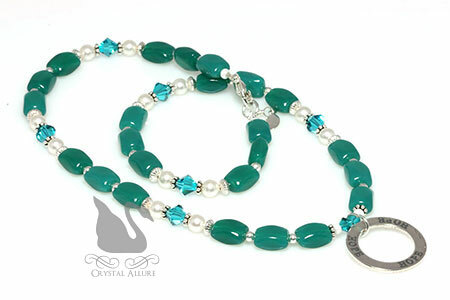 The design features a 22mm sterling Circle of Hope ring pendant with beautiful teal Czech rounded rectangle beads, teal Swarovski Crystals, white Swarovski Pearls, .925 Bali, sterling silver beads and finished with our sterling silver signature jewelry tag. Necklace measures at an 18" princess length. Contact us for a pair of coordinating beaded earrings to match! 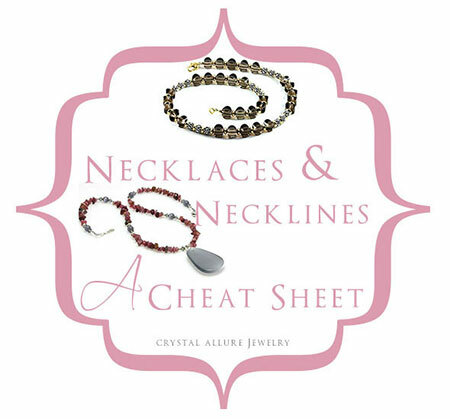 Ever wonder what necklace would look great with a square neckline? Or a cowl neckline? Well, I wondered too! So, rather than re-invent the wheel, I looked to Imogen Lamport, Image Consultant, and author of the Inside Out Style Blog. 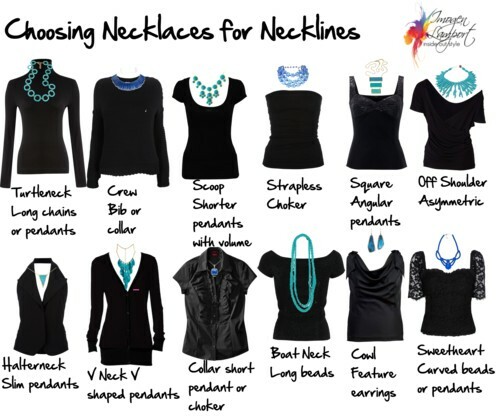 Imogen put together a fantastic visual of what necklace shape looks best with different necklines (see below). Turtle necks – look best with longer necklaces; long chains or pendants. Crew necks – best with short necklaces such as ‘collar’ or bib styles. Scoop necks – fill in the space with multiple strands of beads or larger scale pendants; think shorter pendants but with volume. Strapless – look great with chokers (leaving your lovely decolletage bare). Square necks – look for pendants with an angular finish to harmonize with the angular neckline. Off Shoulder or Asymmetric necklines – best with necklaces that aren’t symmetrical; a necklace that has its' own asymmetry works as a great compliment to the asymmetry of the neckline; alternatively a long string of different sized and shaped beads can work equally as well. Halter necks – create a narrow V neck, so look for a narrow pendant with a sharper end. V neck – this most common neckline looks best with a necklace that matches the shape of the V.
Collared shirt (button down) – typically do not have much space for anything too wide, so a choker style works best with a long neck; if you have a short neck, a slimmer pendant that sits above the last open button. Boat neck – a long string or two (or three!) of beads is ideal for this neckline. Cowl neck – this already detailed necklace has volume, so either a short and small pendant or a pair of feature earrings instead of a necklace. Sweetheart – a curved necklace with width that will ultimately balance the open decolletage of this neckline. View All Handmade Beaded Necklaces or Bead Pendants. Today is a perfect day for a summer wedding. In fact, one of my customers will be married today. I'm so happy for her. I really enjoyed creating her unique one of a kind wedding jewelry pieces and can't wait to see pictures. While taking in this beautiful day, this morning, I was thinking about all the love that surrounds marriage and wedding ceremonies. As a bride, it really is true that we are just glowing on our wedding day. It's that first love's blush that I wanted to capture when creating these pieces. There are three pieces to this design style. Choose a beaded bracelet, handmade earrings or a beaded anklet. You can wear one piece, all three, or mix and match as you like. Either way you choose to wear these elegant, feminine pieces, they will bead-perfect! A beautiful handmade beaded bracelet reminiscent of love's first blush in a soft pink and white design featuring aurora borealis (AB) Swarovski Crystals, pink fiber optic glass hearts, white fiber optic glass beads and sterling silver Bali. Design finished with a pink fiber optic glass heart and signature jewelry tag. Measures 7-1/2". These are truly an everyday pair of beautiful handmade beaded earrings featuring pairs of white fiber optic beads, pink fiber optic glass hearts, sterling silver Bali spacers, light rose and aurora borealis Swarovski Crystals. Sterling silver post earrings. Length is 1" from the bottom of the ear wire. 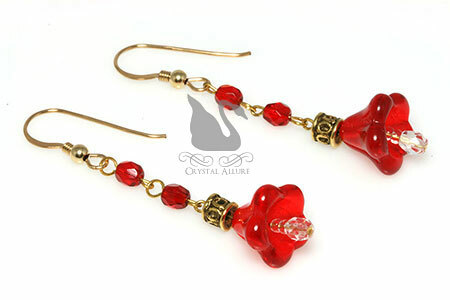 If you happen to have sensitive ears or can't wear the heavier chandelier earrings, these are definitely your earrings! 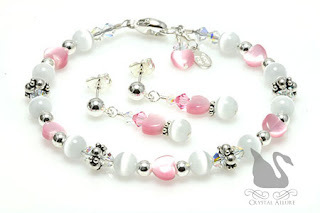 To finish off this beautifully elegant jewelry set is a handmade beaded anklet in a design that features the same pink hearts, Swarovski Crystals and sterling silver beads as the pieces above, except, this ankle bracelet includes lovely pearlized white seed beads. Design is finished with a delicate pink fiber optic glass heart and signature jewelry tag. Measures 10-1/2". Well, you can't really sink your teeth into these delicious handmade summer beaded lampwork earrings. But they do look delicious enough to want to -right?! It's also shark week and it is no secret I'm a fan of sharks. Although, let me clarify. I'm a fan when I'm watching from land, or the comfort of my own home! You can see how this week inspires me with both the shark week inspired handmade beaded jewelry in deep blue crystals and the ode to one of my Sanibel, Island vacations and what lingers beneath the surface. 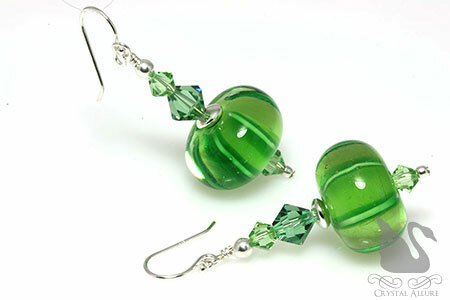 It doesn't get any sweeter than these handmade lampwork earrings featuring melon green artisan lampwork glass beads, peridot and erinite Swarovski Crystals accented with sterling silver beads on sterling silver french hook ear wires. Length is 1-1/2" from the bottom of the ear wire. For a delicious (and calorie free!) twist on the favorite Ben and Jerry's Cherry Garcia ice cream are these rich artisan lampwork glass beads flanked by Swarovski Crystals in olivine green and burgundy. The design includes .925 sterling Bali spacers and Bali star bead caps. These gorgeous (and yummy!) artisan boro glass lampwork beads were created by the talented Russ Powers. 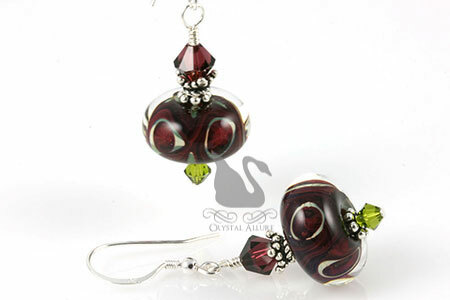 Each bead has a swirl of both rich cherry burgundy and chocolate colors. These handmade beaded earrings are finished with sterling silver french hook ear wires and measure 1-1/4" from the bottom of the ear wire. The wedding season is in full swing and that makes it the perfect time to consider wedding gifts. Especially gifts for the Bride! Sure you could give the latest kitchen gadget, bath towels for the home or one of those wedding chatchkes. But, I prefer to give unique gifts that are handmade and will be a daily reminder, for the Bride, of her special day. Which is why I created these classy and feminine unique bead keychains that easily convert to purse charms! Either one you choose, both make the perfect treasured keepsake gift the Bride can carry with her every where she goes. Adorn your keys, purse or handbag with this special Something Blue wedding keychain. This handmade beaded keychain is a silver keychain with pearls and crystals. Design features an 18mm blue faceted glass bead showered with aurora borealis Swarovski Crystals, Swarovski Pearls and a single blue Swarovski Crystal along a sterling silver flat cable chain and finished with a heart ring key chain. 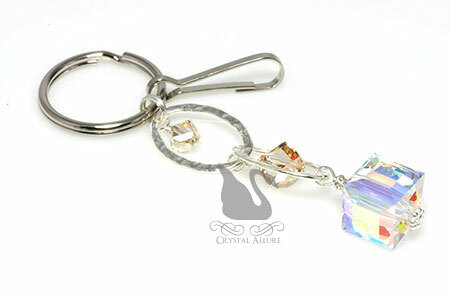 Want to make this key chain a purse charm? 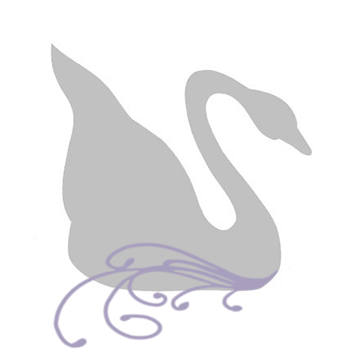 Request a FREE silver hook at checkout. Total length measures 4". This multi-purpose handmade beaded keychain also doubles as a purse charm! Whether you are looking for an elegant keychain, handbag charm, purse charm or even the perfect gift for the perfect bride -this key chain is a conversation piece all in itself! Designed with a gorgeous 12mm aurora borealis Swarovski Crystal cube, two sterling silver hammered hoops accented with golden shadow crystals. Finished with a 24mm key ring and silver hook. Total length measures 3-1/4".